Porchetta is a pork lover's paradise down in the East Village. Just a small takeout stand - they have counter seating for at max 5 or 6 people - Porchetta delivers with a simple menu of slow roasted pork - tender, succulent, delicious. Porchetta serves two dishes - pork sandwich and a pork plate - the first is piled into ciabatta sourced from Sullivan St. Bakery and the plate is served with beans and sauteed greens. For those vegetarians dragged by their swine loving pals - there is a mozzarella sandwich. For sides - the crispy potatoes and the burnt ends is the must have - basically fried pork rinds - I mean, really is there anything better?? As for dessert - cross the street and pick up some delicious cupcakes from Butter Lane. 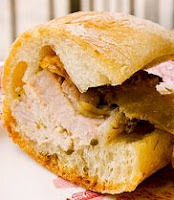 a porchetta sandwich I had at a Harrods airport cafe in the Lisbon airport - random, I know - but if you are ever passing through a Harrods cafe - you MUST try their suckling pig sandwich. Utterly heavenly - soooooo moist - it beats Porchetta. But since we are most likely not going to be able to go to Harrods on a whim - Porchetta + Butter Lane is a recipe for a perfect casual Friday night!